What is the Biml to create an SSIS Script Component Source? This is a very simplistic demo but you'll see the magic is distilled to two sections - the first part is where we define the output buffer, lines 20-24. In this case, I specify it is DemoOutput and then provide a columns collection with a single column, SourceColumn . The second set of magic is in the CreateNewOutputRows , lines 54 to 58. There I use the buffer I defined above to inject a single row into it with a value of "Demo". Nothing fancy, everything is static from a Biml perspective but I needed to know the syntax before I could try something a little more advanced. Using this a simple matter of adding a new Biml file into an existing SSIS project and pasting the following code. 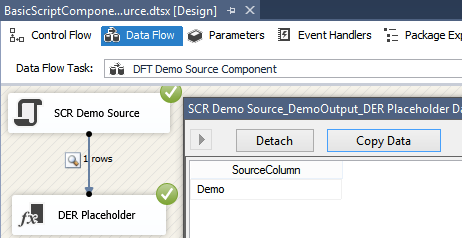 What results from right-clicking on the file and selecting Generate New SSIS package will be a single SSIS package, BasicScriptComponentSource, with a Data Flow task "DFT Demo Source Component"
The data flow "DFT Demo Source Component" consists of our new Script Component, SCR Demo Source, and a Derived Column, DER Placeholder, so you can attach a data viewer if need be. Use the following Biml to generate your package and feel free to tell me in the comments how you adapted it to solve a "real" problem. (one row enters, one row leaves) and not a source. 'Output0Buffer' does not contain a definition for 'ColumnName' and no extension method 'ColumnName' accepting a first argument of type 'Output0Buffer' could be found (are you missing a using directive or an assembly reference?). This is occurring for each column. The columns are dynamic and come from a c# class so should be the same names and casing everywhere. I've checked the code in a console app and it reads the XML file fine, but no luck with the BIML. There are about 250 odd columns so I am trying to avoid doing this manually so if you have any ideas what I am doing wrong I'd really appreciate it!